Marco is working on creating Dutch Configuration maps for MindReader and Mark Task Complete. As part of that effort the language specific code was eliminated for Mark Task Complete and moved to the configuration map. 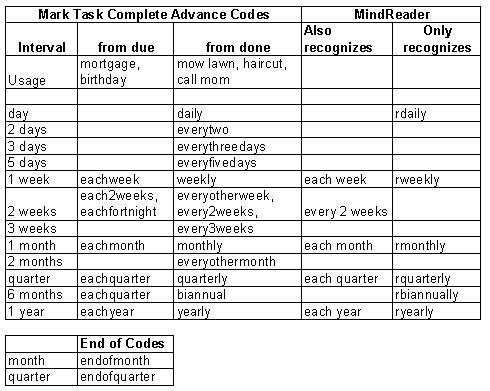 The project also triggered a review of the keywords recognized by MindReader for setting the repeat codes for Mark Task Complete and some improvement opportunities were identified. In particular there is some overlap between strings being recognized as due date codes and repeat codes (e.g. “end of month”). Secondly some common repeat codes often cause false positives. For example “read monthly report” is often a single task with an attachment rather than a repeating task). With the latest update to MindReader, the following default MindReader category keywords changes have been made. The actual codes in Mark Task Complete remain the same and the program will recognize either keyword when entered as a category. These can still be entered manually as categories or set by MindReader using the endofmonth and endofquarter keywords. This may evolve a bit further as the Dutch language project progresses. The “each” and “every” framework is not very intuitive. We’re looking for other ideas (e.g. weeklyfixed, weeklyrelative). Comment below with ideas on what would make sense for you (to be recognized by MindReader and/or set in category field). Hi AO any idea when the dutch configuration map is comming out? I modified the standard map to work with dutch words but that’s not always working. Haico — I just uploaded a mindreaderconfig-nl.mmap to the wiki that Marco has translated for us. You need to download, rename as mindreaderconfig.mmap, and save to My Maps\AO. At some point we will build into a setup program.